Our next destination after Beijing was Datong which we managed to reach by bus. I’d never heard of Datong before visiting China. Unlike Beijing or Shanghai I didn’t have preconceived ideas or expectations when we got there. And yet, a few miles out of the place is one of the most beautiful and impressive sights I’ve seen so far. But before getting there, there was the simple matter of finding somewhere to lay our hats for the night. By this point Paul and I had really gotten into the backpacker swing of things and had done away with booking accommodation before getting to our destination. At least we knew where we wanted to go and we had the address. Even better, taxis in China are as cheap as boiled rice so we could avoid the whole public transport palaver and get Mr. Taxi man to take us there pronto. When we got into the cab our taxi driver kept trying to tell us something but we couldn’t quite figure out what he wanted to say. The cynical traveler in me made an appearance, thinking that the driver had no idea where this place was. At least we knew it was by the train station so we got him to stop us there. After an hour of to-ing and fro-ing, checking and re-checking the map we realised that our hostel had been magically replaced by a new hotel. So THAT’s what he was trying to tell us. By this point we were so tired that we didn’t care how much it would cost so in we went and asked for their cheapest room. Seeing not one, not two, but five receptionists behind an empty desk we figured check-in would just take moments and didn’t even bother to take our bags off. After much discussion, one receptionist gave us 6 zillion forms to fill in, another disappeared with our passports, one receptionist offered us pens while the other two looked on and discussed us between themselves. Thirty minutes later as we took the bags off our weary shoulders we were reminded that quality always prevails over quantity. On the bright side we managed to get a room for £16 so we were pretty chuffed with that. The only thing that stood between us and a good rest was the simple matter of paying. As sod would have it we could only pay by cash, and of course Paul and I hadn’t taken out cash before we left Beijing, of course we didn’t have enough money to pay for the room, of course we couldn’t get into our rooms before we paid and of course it took us an hour and two goes before we found an ATM that gave us money. I don’t know if it was all the hassle we went through before we got to our room, but the minute we opened the door and got in it seemed we’d entered Nirvana. A lovely hotel room, all modern and freshly decorated, with a huge double bed and thick cotton sheets. Our own bathroom all clean and sparkly and new. I did a little jig of joy and jumped on the bed. Who’d ever thought that cotton sheets and ceramic toilets could prove so exciting! Everything is relative in life. 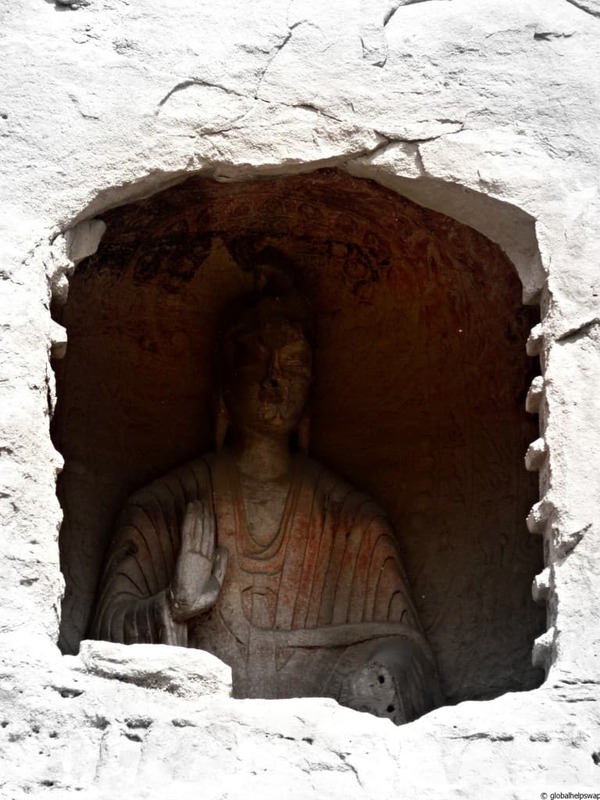 We woke up bright and early the next day, bought our bus tickets for 2pm that same day and then set off to Yungang grottoes, the main attraction of Datong. 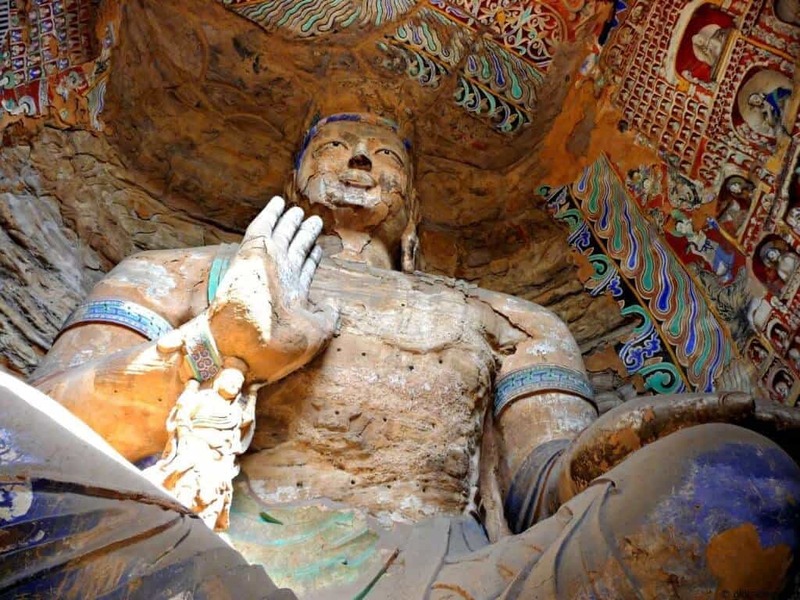 The grottoes are ancient Chinese Buddhist temple grottoes and are one of the three most famous ancient Buddhist sculptural sites of China. We decided to try to get there by public transport – bad move on such a tight schedule. After an hour or so on the bus we realised that the shops we were passing all looked familiar. I went to double-check with the bus driver and sure enough his sigh and look told me that he had forgotten to tell us when to get off. The bus had looped back to its starting place with us still on board. Our second attempt finally got us to the caves. The initial three hours we originally had to see them had now dwindled to one, but at least we’d actually made it there. We then proceeded to run around like guide-book writers! Like everything in China, the place was massive, so it took us a good 15 mins to get to the actual caves. The lead up was beautiful and if we had more time we would have spent most of the day there. Instead we saw something we liked, took a quick snap and hurried on. It was such a shame as the place is stunning. 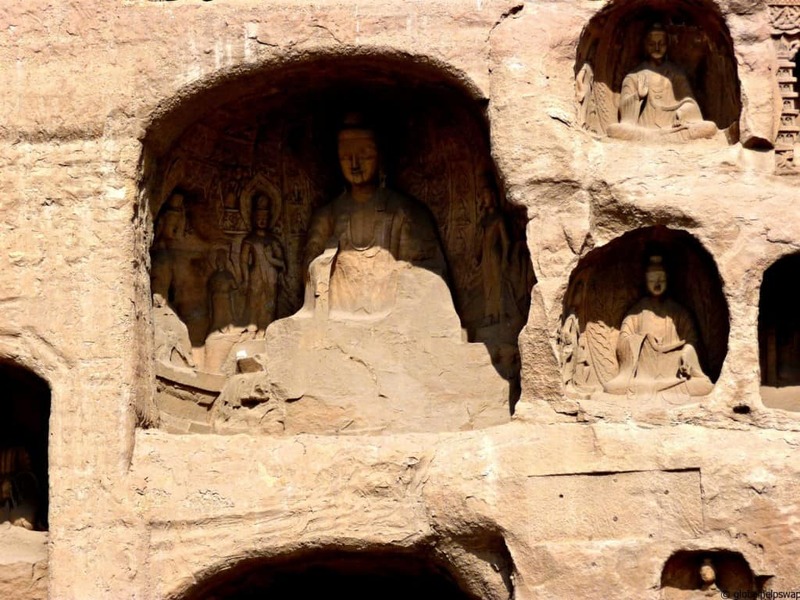 The grottoes are an amazing example of Chinese 5th century stone carving. 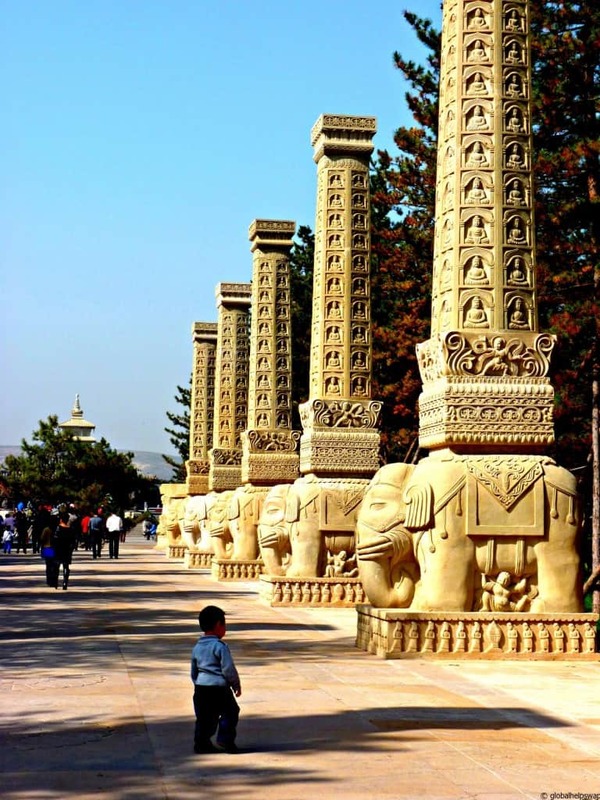 All together the site is composed of 252 grottoes with more than 51,000 Buddha statues. Imagine entering an ancient cave and coming face to face with a giant foot. You slowly look up and realise that the foot belongs to a cross-legged Buddha that fills the entire cave. Around him are hundreds of other smaller Buddhas also carved into stone. The whole scene is jaw dropping. 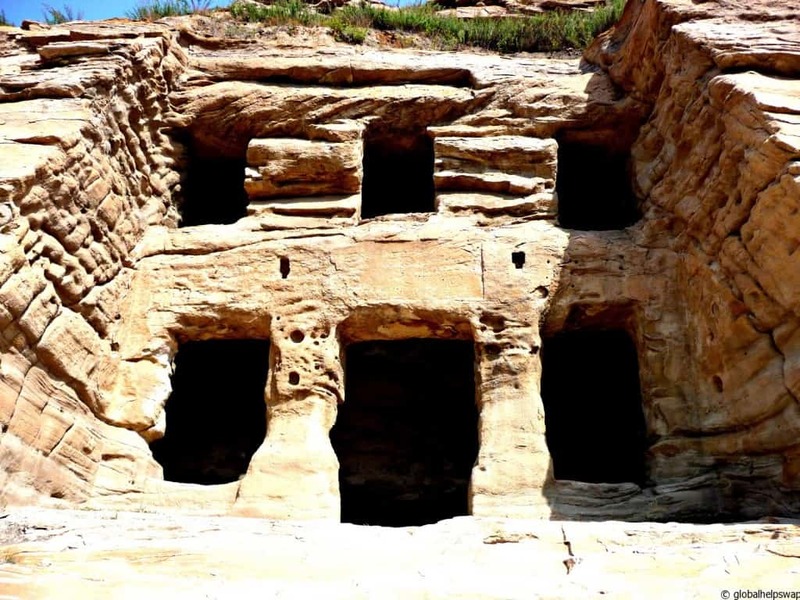 If you ever come to China, these caves are not to be missed. We’d recommend spending at least half-a day rather than an hour here though! 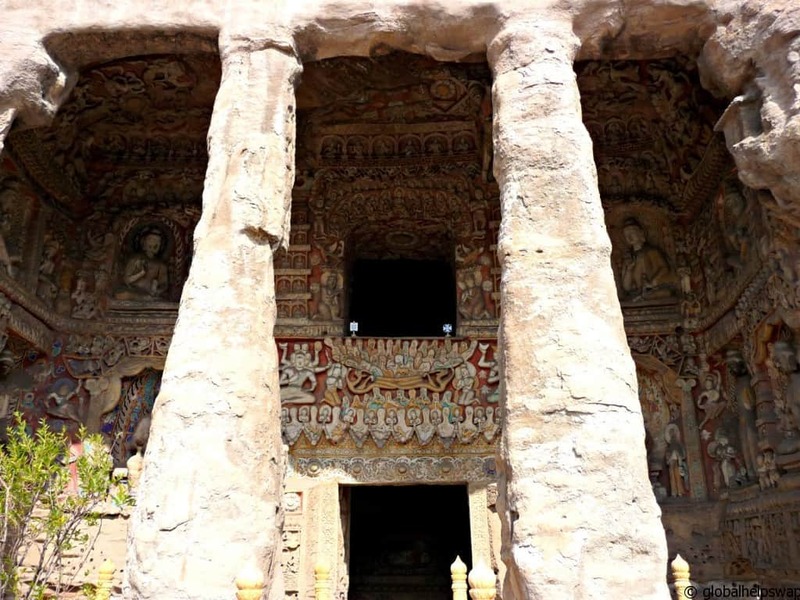 We have seen many Buddhist temples, monuments and monasteries on our travels and we would rate the Yungang grottoes in the top 3 sites. 2) We stayed at The Jiahe International Express Hotel. At the time of writing it was more than sufficient. 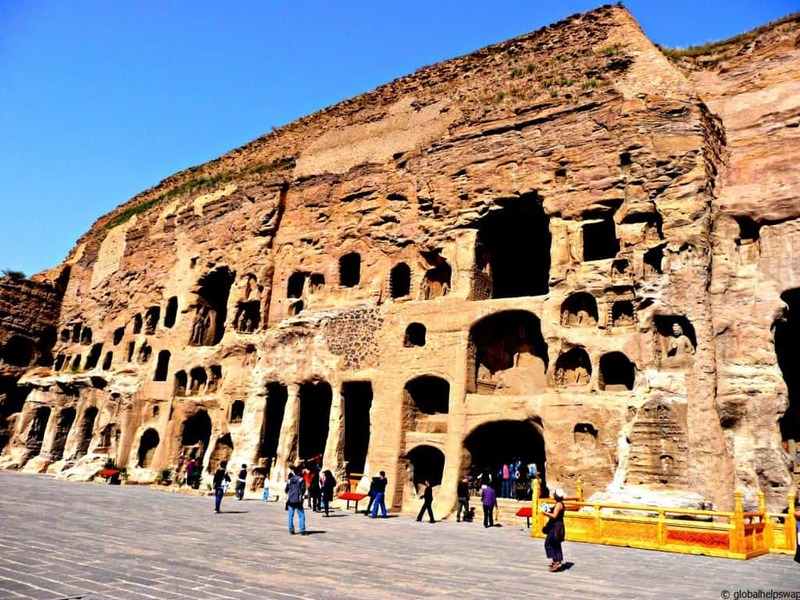 3) Take bus 3-2 from outside Datong train station for the Grottoes/ Caves. It should take 50mins. 4) If you have time go and see The Hanging Monastery too. As stated above, we had no time to see it. 5) The local treat is Shaomai, a steamed pork dumpling with a crinkled top dipped in vinegar. Yum. 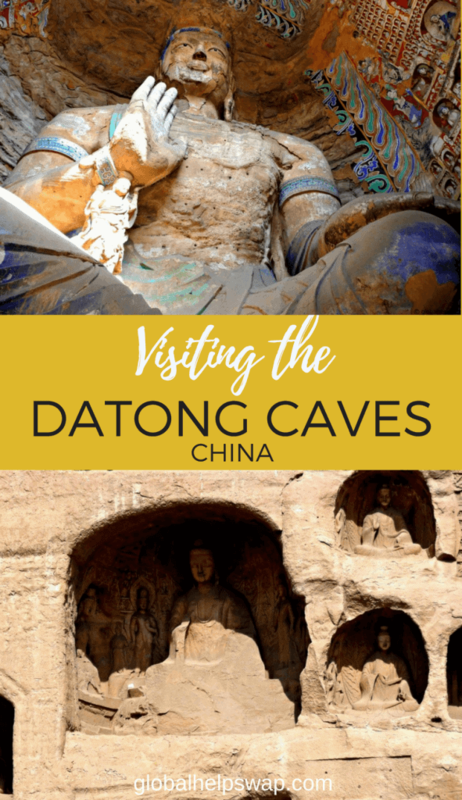 Have you been to Datong? Can you recommend any other tips for our readers? 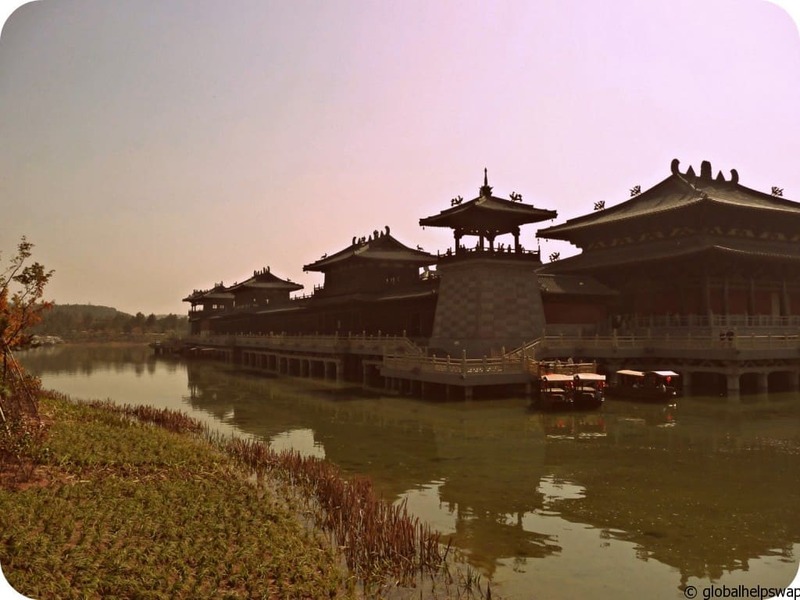 The next leg on our Chinese Odyssey was from Datong to Pingyao. It involves packed trains, satellite dishes and cuddly toys! 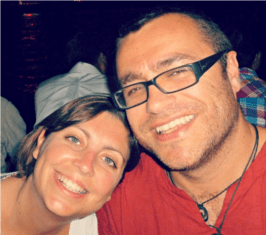 Why not sign up here to receive the blog in your inbox. Hi Scott and Nick. Thanks for the comments! It is an amazing place, just wish we had more time. 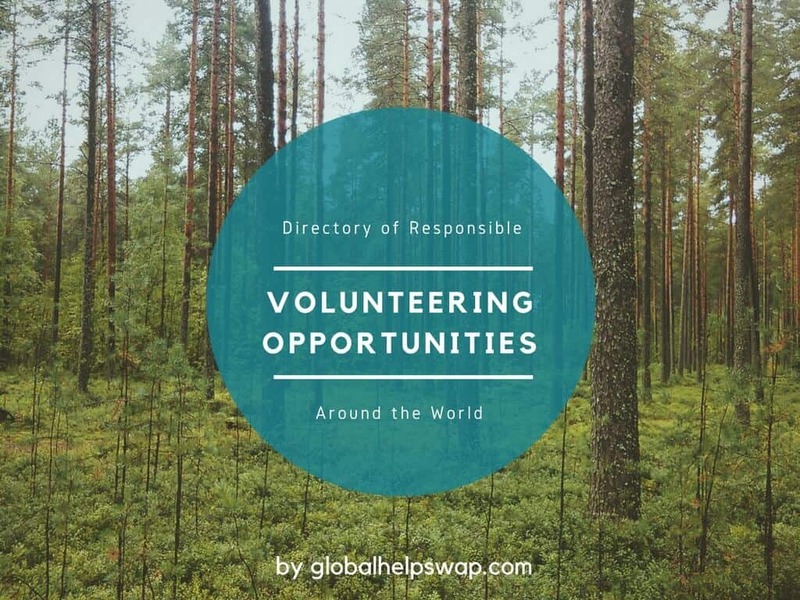 Great pictures and awesome post! Cheers Mike! Glad you liked it. Looks like you guys had great weather. We were there in April last year and it was so windy and cold! The lake was frozen over but that didn’t dampen our experience. It’s an amazing place!! 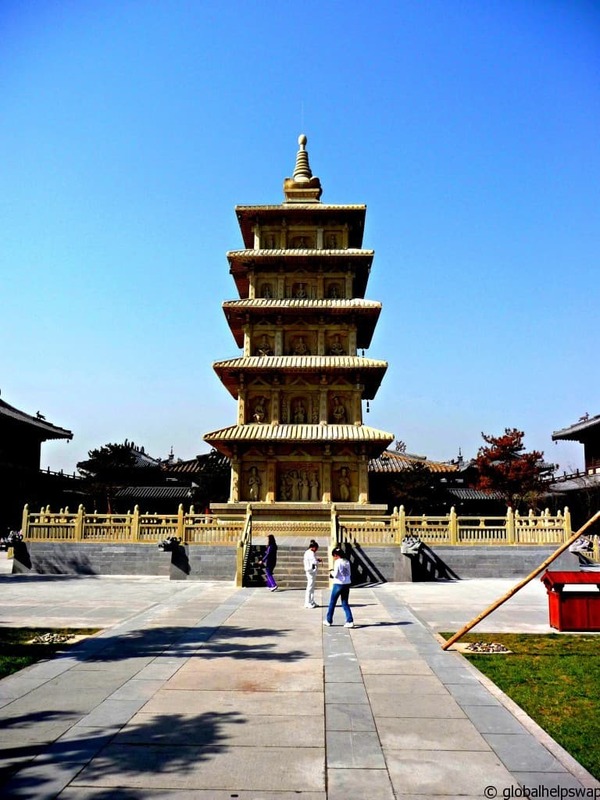 Yungang is very good to visit in combination with Wutai Mountain and Pinyao Ancient city. China. We run tours to these places daily. is a park and can be visited be all age groups. religion at that period in Chinese history.